Topics: Innovation, Definition, and Contacts. 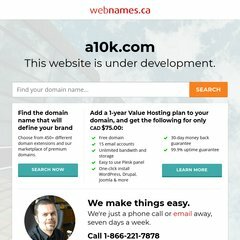 A10k.com's server IP number is 64.69.83.162. ns3.webnames.ca, ns1.webnames.ca, and ns2.webnames.ca are its DNS Nameservers. Peer 1 Network Inc (New York, New York) is the location of the Apache server.